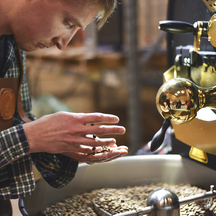 I am Quentin, a great coffee lover, I like coffee so much that I decided to leave my post as a primary teacher in Brussels to start my own coffee roasting business in Brussels. It's a very big leap and my motivation is not only found in my love for coffee. I want to redefine our relationship with coffee and have a greater social and environmental impact through a change in coffee consumption. I was strongly influenced by my "Trade not Aid" experience in the Democratic Republic of Congo. This is how my quest for traceable and ethical coffee began with my wife Leslie.